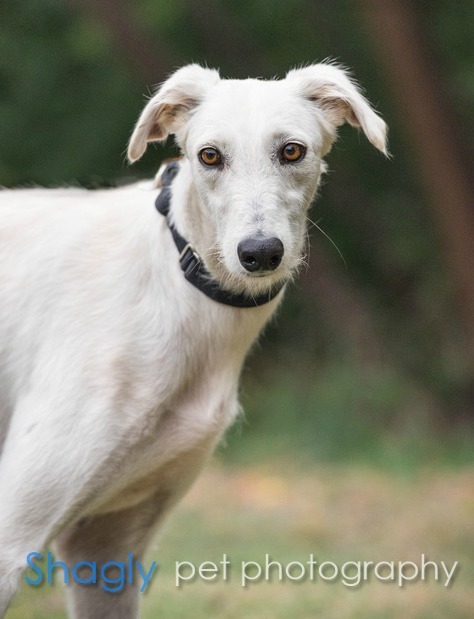 Kasper is an approximately 2 year old white male greyhound who is part of a cruelty surrender of 8 from west Texas on September 21, 2016. He arrived weighing only 42 pounds, and must gain some much needed weight prior to completing his medical procedures. Kasper is carrying a very high load of intestinal parasites, and treatment for these has started. Kasper is not condsidered to be cat or small animal tolerant at this time. Kasper has completed all his medical procedures after gaining some much needed weight as well as an “all clear” on his intestinal parasites. This boy is ready to find his forever home! Kasper is an absolute doll. He loves everyone he meets. If Kasper could hire someone to rub his belly 24 hours a day, 7 days a week he would be thrilled; it’s his absolute favorite thing in the world. He also loves toys of all kinds. Kasper has lots of energy; he really enjoys playing with our greys outside in the yard. 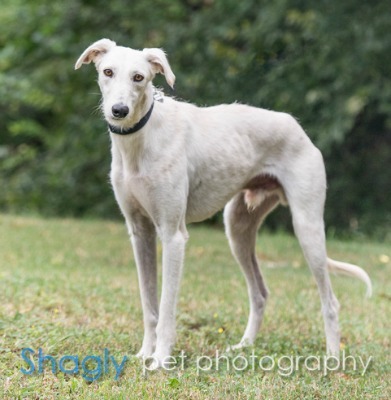 He would do best in a home with a yard and another large dog who is able and willing to run around and play with him. He loves to go for walks and is well behaved on a leash. Kasper gives very sweet little kisses and makes sure he gives everyone in the house a "Good Morning" greeting when he wakes up. He sleeps very soundly through the night and does not get up until we do. He eats well and has never shown any food aggression. He rides well in the car; lying down the entire time. Kasper is very smart and would enjoy obedience and/or agility training. He loves to be around his people and makes sure he is right with you when you are home. Kasper really like kids and loves to play with them. He is very affectionate and loves to cuddle. Is this friendly boy your next love?